Amiga. Spectrum. Atari. BBC Micro. Does a little shiver of excitement run down your spine when you read those hallowed names? Yes? You're not alone. Vintage computers and consoles are making a comeback, of sorts. No longer gathering dust in attics across the land, they're being re-introduced into the wild to show a new generation of computer fans what they were capable of and, more importantly, what people can do with them today. There are discussion groups, fan clubs, websites, museums and even festivals dedicated to classic computers. More and more people are embracing old-school computing and they're becoming increasingly vocal about it. There are people out there whose hobbies and even jobs revolve around preserving these technologies for later generations, keeping them alive and functioning so others can discover their delights. And there are more of them than you may think. The recent Vintage Computing Festival, which was held at The National Museum of Computing (TNMOC) at Bletchley Park, made this very apparent. 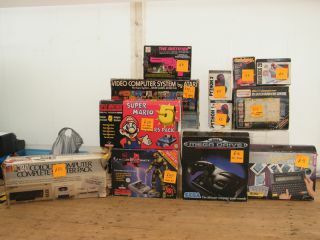 The biggest celebration of vintage computing held in Britain to date, the VCF attracted over 30 private exhibitors, along with thousands of fans of technology through the ages. It wasn't just a static display of old computers in glass cases – visitors could touch the old machines, buy them, play classic games on them, program them and even log on to Twitter from them. Old technology in action. It wasn't just a curiosity – the festival was a celebration of these old computers, especially the rarer ones. The machines weren't just from the many stored at TNMOC either, with many from private collectors keen to show off the rarities they owned, and to share them with an appreciative crowd. Whispered gasps of "It's a ZX80 – I always wanted one of those!" and "Is that really 3D Monster Maze?" abounded. For a vast number, the festival was a homecoming; a return to their digital roots. Versions of the Vintage Computer Festival (VCF) have been running for over a decade in the USA – it started, naturally, in Silicon Valley – so it was high time it made its way over to our heritage-laden shores. We spoke to lead organiser Simon Hewitt to ask how the UK version came about. "One of TNMOC's trustees, Kevin Murrell, had heard about the Vintage Computing Festivals that were a regular event over in the US," Hewitt explains. "He mooted the idea of running a similar event here among the volunteers and I picked up on it. We combined the basics of the US and German events, but put a British slant on it by including more of our homegrown machines. We also wanted to give it a bit more of a broad appeal to families, as well as making it a showpiece event for the museum. I phoned around various friends and contacts who were interested in 'retro' computing and it all started from there." So why was this the right time to try it out in the UK? "Interest in retro computing and vintage computers has been steadily increasing over the last two or three years," Hewitt explains. "Various smaller events had been popping up all over the country on a regular basis, and there was always a healthy turnout in terms of visitors. Television programmes such as Micro Men and Electric Dreams, which the BBC originally screened in mid-2009, attracted healthy viewing figures that have warranted regular repeats. This told us that the interest was out there. "I spoke to a few friends who either ran or attended the events which were already taking place, basically asking them, 'Do you think it is worth us trying to do something on a much bigger scale?' The answer was a resounding 'yes', so we did." There's no doubt that the VCF was a huge success. "No one had predicted what the atmosphere would be like," says Hewitt. "It actually felt like a summer festival – lots of smiling faces and people genuinely enjoying themselves." The venue for the festival couldn't have been more apt: the TNMOC is located slapbang in the middle of Bletchley Park, the birthplace of digital computing. Even when not playing host to events such as the Vintage Computing Festival, it's TNMOC's mission to collect and restore computer systems, and to allow people to explore that collection for inspiration, learning and enjoyment. The museum is a charity, relying entirely on donations to continue showing off the development of computing. Its range works back from today's digital commodity masterpieces to the pioneering wartime efforts that resulted in machines such as Colossus, the first programmable electronic computing device, which was used by British codebreakers to read encrypted German messages during World War II. It's staffed mostly by volunteers who give up their time to help share these computing relics with the general public. Kevin Murrell is one of a group of trustees that set up TNMOC. We talked to him about the VCF event and asked him if he thinks the appreciation of vintage computing is on the rise. "Over the past few years, appreciation of our computing heritage has really taken off," he answers. "People are suddenly realising how far we have come in just a few decades – in their own lifetimes. One of the most common comments we all heard at the VCF was 'I've used one of those'. People realise that they are living through a time of momentous change and that they have been part of it."